With a name like The Dipsomaniacs you would not expect what is actually presented on Bumble-bee Eyes, and I, for one is glad that the name is somewhat misleading. The Dipsomaniacs is really Øyvind Holm (voices and most of the instruments) with help from a couple of additional musicians. What we get is a "lo-fi-close-to-no-fi at all-fi" as stated on the insert. Nearly half of the songs is him alone with voice and (mostly distorted) guitars, and despite his own description of the recording facilities, the record sounds surprisingly fresh. Bumble-bee Eyes starts off with Luncheon which sounds like a decent John Lennon demo for a track that was left over from the Revolver sessions (think Scoop by Pete Townshend). And, yes, The Dipsomaniacs is not afraid of stating the Liverpudlians as an important source of inspiration. You can also hear traces of newer American artists such as Portastatic or Refrigerator. It isn't until the fourth track, Cul-de-sac, however, that you begin to realise what The Dipsomaniacs is capable of. This long, introvert piece is all the title suggests, with its vintage Pretty Things melody and arrangement - creepy! 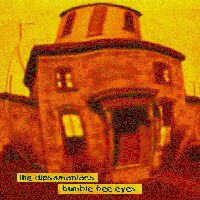 The Dipsomaniacs have worked a lot on the arrangements of their songs, and sounds more thoroughly prepared than most of their lo-fi contemporaries with the use of keyboards and the occasional flute and fiddle. Add to this songs far above average, with Telephock, Differing Pleasures and Cul-de-sac as outstanding on the record, and Bumble-bee Eyes competes with Motorpsycho and Finn Coren as 1997's best release from Norway so far. Come to think of it, it's a long time since I heard Norwegians sing English as good as Mr. Holm. With The Dipsomaniacs, along with artists such as Bronson Comet Lighter and Stuntbike, the future for underground pop music in Norway looks bright! The Dipsomaniacs can be contacted through Peephole Records, c/o Øyvind Holm, Innherredsveien 88 B, N-7042 Trondheim. If you are lucky, there may still be some copies on burgundy vinyl left. You may also want to check out our Dipsomaniacs articles/reviews: Bellows Make You Burn More Brightly, Reverb No Hollowness, Stethoscopic Notion, Subterfuge EP.